There is much confusion about nofollow links around the various forums we visit so today we are going to gather up all the reliable information we could find about the nofollow attribute and place it here. Read through and make your own decision whether getting a link from a blog or site that uses the nofollow attribute is worth it or not. There is No Such Thing as DoFollow! There is no such thing as a dofollow link. This incorrect word/phrase is constantly used across the web. By default all links are followed by the search engine bots. Before the nofollow attribute was created you had to use a meta tag in the head section of your page(s) to tell all bots you did not want the page links followed. The line of code above tells the polite search bots to index this page but do not follow any of the links on the page. Today, you still have to do this for the bots that do not honour the nofollow link attribute. Originally the nofollow attribute was brought into existance with the purpose of trying to curtail blog spam. If you have a blog or site where the general public can leave a message (reply or comment) on your article quite often the software you are using allows the person to insert a link to their own website. While this is good for legitimate comments you make (people reading your comment can see who is behind the comment if you make a good comment) it attracts spammers trying to get links for themselves or their customers. This spoils it for everyone unfortunately. Google got the ball rolling for the use of the nofollow attribute in 2005. These days Google, Yahoo! and Bing support the nofollow anchor tag attribute, each in their own way. We explain later in this article. Google created a monster by creating the nofollow attribute. SEO people started using the nofollow attribute to do what is called PageRank sculpting. PageRank sculpting is where one tries to manipulate the Google PageRank of pages by reducing the flow of PageRank from one page to another. A nofollow link is a web page link which contains the nofollow attribute within the anchor tag coding. Not all search bots honour this attribute. Read the referenced article to see how Google suggests the nofollow attribute be used. There is also a video on that page you can watch. Note that with the rel=”nofollow” attribute, a REP-compliant bot will not follow that specific link on that page. However, if any other page on the site (or a link on an external site) refers to the blocked page without any REP directives blocking it, the page may still be crawled and could make it into the index. This caveat goes for all REP link blocking directives that are not consistently applied to a specified page. And in the case of external sites linking to the page on your site that is supposed to be blocked, which local webmasters cannot control, these pages may still be crawled and indexed. In this case, the <meta> tag’s noindex solution for that page is the best option. To prevent the crawler from following links from a webpage, use the NOFOLLOW tag. Wikipedia has a nice chart in their nofollow article on how the search engines interpret the nofollow attribute. You will see ads and lists of sites around for links which do not use the nofollow attribute (a.k.a. dofollow). The search engines are not stupid. If all your incoming links are from only sites without the nofollow attribute they will know what you are up to – unnatural link building. The best link building strategy is to not care about whether the link is going to be nofollow or not. It looks much more natural for your backlink portfolio to be all mixed up. Is It Worth Getting a NoFollow Link? The idea behind incoming link building (besides actually getting a link to your site) is to build a reputation in your chosen field as someone who knows their stuff. How do you do that? By participating in communities like forums, on social networking sites and by joining the conversation on blogs. Don’t worry about whether the site is using the nofollow attribute. Worry more about buiding your reputation and business through sharing knowledge. Build a relationship with the site owner by participating on their site. They might ask you to write a guest article for them or write about your site/business. Only SEOs and marketers are obsessed with whether a site uses the nofollow attribute or not. The average surfer probably doesn’t even know what a nofollow link is. Readers of the site could turn into friends or business alliances, you never know. Can Nofollow Links Hurt Me? Should I use rel=”nofollow” on internal links to a login page? In this video Matt Cutts goes over using the rel=”nofollow” attribute within your own site. Are You Still Worried About Nofollow Links? Have we helped you decide whether worrying about the nofollow attribute is really worth the worry? Leave your thoughts in the comments below. We would love to discuss your thoughts on nofollow links. The title attribute, a HTML attribute that is sometimes misused and other times not used enough. Used properly the title attribute can add accessibility, usability and search engine optimization benefits to your web pages. The title attribute is a bit of coding added to HTML elements (tags) which provides additional information related to the element when a user places their mouse over the element or assistive technology reaches it as it works it way through the document. Where Can I Use the Title Attribute? In the HTML 4.01 specification, the title attribute cannot be used for the base, base font, head, HTML, meta, param, script and title elements/tags. That makes sense, these elements are not seen by the visual users. Note: HTML5 is not a standard yet. Things can change between now and then. For now, let’s concentrate on the places where you can use the title attribute that increases the accessibility (see quote below), usability and search engine optimization of your web pages. I used the most popular commercial screenreader JAWS and the most popular free alternative NVDA. It was an incredibly enlightening experience and I learned a lot (here’s a list of what I learned). One of the main things I noticed is that the title attribute isn’t read aloud, AT ALL. There’s an option in JAWS that allows you to read title text instead of the normal anchor text, but it’s not enabled by default. The only very tiny exception a title attribute will be read is if there’s absolutely no link anchor text, and that’s rare. Even if the link wraps an image, the screenreader will chose to read the image’s alt text instead of the title attribute. The A element is the tag you use to create a link. It is also refered to as the anchor tag. The abbreviation element used around an abbreviation you use in your page. Some readers might not know what that stands for. You can let them know by using the title attribute. The acronym element used around an acronym helps those who are not familiar with the acronym understand what it means. Note: In HTML5 the abbr element will represent an abbreviation or acronym. The area element is used in conjuction with the map element when an image map is used. As the name descibes the button element creates a button that when clicked something happens. The cite element is used with the blockquote set of tags to provide the link where the quotation was taken from. The img tag already requires an alt attribute to describe the image however if the image is clickable (has an anchor set of tags around it) then you should add a title attribute to the link. <a href="http://www.webpagemistakes.ca/image-alt-tags/" title="Image Alt Tag – Image Alt attribute"><img src="http://www.webpagemistakes.ca/images/image-alt-tag-example.png"
…To further develop keyword relevance for those pages, also include the title attribute to your anchor tags…. …Think of the anchor text as your primary description of the linked page. But if you do inline linking within the paragraphs of your body text, you need to maintain the natural, logical flow of the language in the paragraph, which can limit your link text description. As such, you can use the title attribute to add additional keyword information about the linked page without adversely affecting the readability of the text for the end user…. Some SEOs abuse the title attribute (just like the alt attribute) as a place to stuff keywords. Remember the purpose of the title attribute is to provide more information. The search engines all say write for your readers not the search engines. With this in mind, if you include the title attribute in the appropriate places this improves the accessibility and usability of your website or blog which can snowball into indirect search engine optimization improvements through organic incoming links. i.e. People will spread the word on social networking sites and on their own sites about how great your site is. Don’t worry about whether there is a direct search engine optimization benefit from using the title attribute. Use the title attribute to improve your visitor’s experience. The indirect benefits of providing a great experience for your visitors can greatly out weight and tricks to manipulate the search engine results. Got some more places where improved accessibility and usability can be gained by using the title attribute? Give us your ideas in the comments below. Does each category and folder of your site have a “home” page? This might not be a problem for all of you but if you are a DIY website owner you might have forgotten to do this. If you create a folder (say an image folder or one with your shopping cart files in it) that does not have an index page (the default page when someone accesses the folder directly e.g. http://www.yourdomainname.com/images/) they can see all a list of all the files and sub folders in that folder. They also have easy access to all those files by clicking the link in the list. How Do You Stop Directory Listings? Create a home page for the folder. Each server has a hierarchy of what the name of the default page name and the extension that should be used. You will have to check your web hosting information to find out which suits your web hosting package. For this example we are going to use index.htm. For folders where you don’t want anyone snooping an empty index.htm file will work. When they access the folder they will see a blank page. You could put a message on the page “No Snooping” if you wish. If you have access to the .htaccess file for your site you can put an instruction in it to stop people (and search engines) accessing the folders without an index page. The visitor will get a 403 Access Denied error page. To be more helpful for those who did this accidently create a custom error page for the 403 error. They are going to get a list of files just like our example above. You might loose the sale because there is not a home page listing the items in that category. Just like solving the images folder problem above you should create a home page for the folder. This time though, create a page with information on it. This is good for the visitors and the search engines. You take advantage of providing information (or at least redirecting the legitimate snooper) to the rest of your information or products in this category, avoiding a lost opportunity to promote what else you have to offer. Play snoop yourself. See if you forgot to add an index (home) page for each of the folders on your site. Have you seen any creative index pages for folders where someone shouldn’t have been snooping? Links make the Internet work. Before search engines were around new people found you via a link from another website they visited. This is how your incoming links grew and grew. Today we have all kinds of places where links to our website/blog can be linked from. What is an incoming link for those who do not understand the phrase. Why are incoming links important? On-site techniques to improve incoming links. Off-site techniques for building incoming links. How fast to build incoming links. An incoming link (also known as a backlink or inbound link) is a link from another location on the Internet that when clicked the person arrives at your site. The link can take them to your home page or any page on your site, it depends on how the person who linked to you set up the link. Incoming links are important mostly because that is how people find you on the Internet. The number of links pointing to your site or a page within your site is an indication to the search engines how popular your site/page is around the Internet. Google has a technology called PageRank (PR – not to be confused with PR as in Public Relations) which looks at the number of links you have and the quality of those links. If you wish to learn more about PageRank see Wikipedia’s PageRank article. In a nutshell, the better your incoming links the higher the PageRank your web page will get. Notice it is a ranking for an individual web page. It is possible for an interior page of your site to have a higher PageRank than your home page. Note: Google themselves say not to get obsessed with the PageRank of your web pages. They stress that one should concentrate on more productive activies when working on the success of your site. Exposure. Just like the older methods of advertising, exposure to as many potential interested readers and potential customers is good. Now that you have those tibits of information the more important part of incoming links is the quality and relevance of the site or web page linking to you than the number of links or PR of the page linking to you. We all start from no where when we launch a website or blog. If you get an incoming link from another new site that has the potential to be a good site related to the theme of your own site that is still a good link if you think long range instead of immediate. On-site refers to your own website or blog. This is the place to start if you want to work on incoming link building. Many people who are in a rush to see their website or blog succeed rush past these easy things they can do and are under their control. Way back in your site planning (you did that right?) you would have studied what your target audience likes and dislikes. Before even thinking of investing any time (or money) into link building your site needs interesting content for the people to read or see once they click that link they found you via. If you do this then you will earn organic incoming links way easier than going out and hunting down places to get a link from. While you should never do things to manipulate your standings in the search results there are on-site search engine optimization tasks you can do help yourself get listed in the search results. e.g. Using keywords or phrases your target audience search for, suitable catchy search engine friendly headings, an easily navigated site, good url structure, etc. This also evolves into more incoming links with less work than hunting down spots to get a link from. Using internal linking (<--what I just did there and other locations in this article) to guide visitors and the search engine bots into the depths of your site will keep visitors and the search bots on the site longer. This also counts as a “vote” for the page linked to. How do you become the “Go To” site for information in your chosen field? By providing good quality information and quality resources for your visitors. Some have an aversion to linking out to other sites because they are scared they are going to loose the visitor. They found you didn’t they? If you provide quality information they will a) bookmark your site b) find you again c) use the back button to backtrack to your site or d) open the link in a new tab or window by choice so they don’t loose their place on your site. A RSS feed is a file on the site listing all your articles as you publish them. Ours is here: Web Page Mistakes RSS Feed. Not only can your visitors choose to follow your updates via your RSS feed, if you are using WordPress there is a built-in mechanisim that “pings” (sends a message to) certain RSS feed sites to let them know you have a new article which in turn creates an incoming link the search engines will find. Tip: Following RSS feeds is a great way to find interesting stuff to share on your social networking sites and find places to leave comments, besides keeping up with the latest updates of the sites you like. Write something controversal. Spread the word to a few people and it could spread like wide fire across the social networks and incoming links from other people writing about your take on a topic. Create an infographic (informational graphic) about something no one else in your industry has analyized. It might get pinned on Pinterest, ya never know. Create a how to post or article and include a video for those who learn better visually rather than reading. Recycle the video as an off-site incoming link technique by posting it to your YouTube or other video site you belong to. Make it easy for your visitors to spread the word for you via social networking tools that post your link to their social network. Off-site incoming link building refers to you doing things on other sites to create incoming links to your site. Go to your social networking accounts and post an update which announces a new article or feature at your own site. There are automated ways to do this but doing this manually and hanging around for a bit could be more effective as you cam immediately thank those who shared your update. The effect of the thank you kind of gets lost afterwards if you do it a day later IMHO. You can get leads on where to comment from your social networks and the RSS feeds you follow. Actually read the post/article and make a thoughtful comment. You get to leave your name and usually you can fill in your website/blog address. Some blogs have CommentLuv which fetches your latest article/post from your own RSS feed. Wooho! 2 links for the price of one. If your own site is ship shape and you have some spare time, you could write an article for someone else’s site in your industry. At the end of your article there is a resource box where you can do a like description about yourself and usually can also link to your own site. Like guest blogging, writing an article for a related industry newsletter can result in an incoming link if they archive the newsletters on their site. If they do not publically archive the newsletters it is still an incoming link from the article that readers can click to visit your site. Go to the site of a product or service you have used and write a review. There are also other places you can write a review like Google Maps (formerly Google Places), Yelp, etc. You could do this on your own site also as an article or endorsement. Write a press release and submit to news sites if you or your business has done something newsworthy. Sponsor an event, contest or cause. They usually have a sponsors page where you will be listed. This is also something you could do as an on-site link building task. If any of the associations you belong to have a members listing, submit your site. Even if the membership is not viewable to the public, you could still get some traffic from other members. There are all kinds of paid advertising opportunities online. Just invest your advertising dollare (or pennies) wisely on the locations where you are going to get traffic from your target audience. Build your incoming links slowly. Nothing screams “I am manipulating the search engines” more than building incoming links too quickly. Granted, the search engines are not going to find all the links you build in a day on that day but if you go from 0 to thousands in a short period of time that will send up a red flag (unless of course you wrote a really hot article that went viral). Got some more incoming link building ideas? Add them to the comments below. Today we are going to discuss creating a website url structure which is search engine friendly and adds to the usability of your website/blog. First we will cover the Uniform Resource Locators (URL) system for those who are not familiar with the term url, give some quick pointers on url structure then further explain good practices when creating the url structure of your website or blog. A url is the location of your page on the web. It is shown in the address bar of the browser, in the search results and is used when someone links to your page within their website/blog, mentions your page on any of the social networking sites or bookmarks the page in their browser. The first part of the url indicates the protocol of the url. There are different types of protocols but for this discussion we will keep things simple and refer to the HyperText Transfer Protocol (http). This portion is your domain name. It is also referred to as the host or server id. As the name used implies, this shows that the web page referenced in “filed” in a folder on the web server. This portion of the url is actual web page file name. The .htm at the end indcates it is a static web page. File names can have different extensions (the .htm part) or depending on how the web server is set up, it could end with a / or nothing at all. A web page does not have to be “filed” in a folder. It can be in the root of your web server file system. e.g. http://www.yourdomainname.com/web-page-file-name.htm. Keep things as simple as possible. This will improve the search engine optimization, usability and accessibility of your urls. Organize you website url structure logically. Use meaningful words for your folder and web page file names. Make your urls easy to remember. A complicated url structure makes it harder for you to maintain the site and complicates the usability of the site for your visitors. If you are considering the search engine optimization aspect of things consider what your url looks like in the results. As you can see from the image above, your url will be truncated in the search results if too long. What does this mean? People may be less likely to click your result because they do not see a clear picture of where on your site they will be taken. A shorter url shown in the search results could lead to more clicks if it is clear to the user where they are going to end up when they click your result. The example above shows a more consise explanation of how the article/section relates to the user’s search. Keep your web page file name short. Try not to go over 3-5 words. You could count the characters in the above examples to get an idea of the character count that works best. If you decide sorting your web pages into folders, try to keep the url structure such that it is no more than 3 folders deep. e.g. http://www.yourdomainname.com/folder-name/folder-name/folder-name/ That being said, less is much better. A Note About Using Folders: Don’t forget to create an index (home page) for the folder. An advanced user may go up to the address bar in their browser and backspace the web page file name out of the url to see what else is in that folder/category. If there is no index/home page/category page in the folder they are not going to see anything. A lost opportunity to have the user explore what else you have to offer. What is the best logical url structure for a site? The one that meets the needs of your target audience and the theme of your site. (smiles) Yes that is a vague answer but no one set up will work for all sites and audiences. In the planning stage of your website/blog you should have done research about your target audience and learned what they are looking for and how they search the net for your particular product/service/information. This will give you an idea how they like things organized. Do they like to search by brand? If so then maybe a url structure of http://www.yourdomainname.com/brand-name/product-name.htm would be the best url structure for your project. Did you pick a subject where sorting into folders is not really required? e.g. http://www.yourdomainname.com/topic-of-page.htm Would work just fine. Pick the url structure logic that best suits your target audience’s needs (keeping in mind the url length issues pointed out above). Make it easy for them to understand where to find things on your site. When possible use words for the names of your folders and web page file names. Why? Because it is much more user friendly that is why (and may give a bit of a boost to your search engine optimization plan). Which of these are you more likely to click in the search results? Not only did they use words, they used keywords/phrases their target audience would use in the search box to find this information. Now just because we have pointed this out that does not mean you over use these phrases. That would be considered a spammy or over optimization technique which will not serve you well as far as getting found in the search results. Unless the store portion of your website or blog is an additional feature of your site the store should be in the root of your domain name. e.g. http://www.yourdomainname.com/product-name.htm Some ecommerce software does this by default on installation. Be careful on how you set up a new ecommerce site if selling is what you plan on being the focus of the site. item1.htm is not descriptive of what the user will find on the page if they click the result link. Something like queen-size-blankets.htm would be more descriptive. If you have various types of blankets in addition to other linen items something like http://www.yourdomainname.com/blankets/queen-size-blankets.htm would help the user see how your store is organized. Notice how we included hyphens between words in our examples? This makes it easier for the user and the search engines to see each word. Don’t use spaces! Some web servers (and browsers) do not like these plus it makes for a messy url listing in the search results. e.g. http://www.yourdomainname.com/queen%20size%20blankets.htm is really hard to read. This is something you should look into if you are using something other than WordPress. You do not need to include the, and, a, etc. in your web page file name as they just make the url long and they are ignored by the search engines. You will notice we have used lower case for our folder and web page file names. This is because it is easier to maintain the consistency across the site (we also name images in lower case for the same reason). It is also easier to read in the search results. Many things you do to accomplish one thing, like usability, also improves other things, like search engine optimization. A proper url structure is one of those things. If you decide to give your existing site or blog an overhaul after reading this don’t forget to use 301 permanent redirects to guide incoming links and the search engine to your new improved url structure. Also have a custom 404 error page in place for those changes you forgot that you will fix once you run your site through a broken link check. Look for your internal links that reference the changed pages also. The broken link check will help find those. Any questions? Ask away in the comment section below. A happy visitor is a returning customer (or reader if you have a blog). The visitors stay on the site longer and cruise around to other pages than the one they landed on via their search in the search engine (or however they got to your site in the first place). You don’t have to have difficulties surfing the net to appreciate the usability features of also making a site accessible. Bookmark your site on social bookmarking sites. Although a lot of the social bookmarking sites use the nofollow attribute to stop the search engines following the outgoing link to your site it does drive traffic to your site which in turn can result in a bookmark on a site that does not use the nofollow attribute. Spreading the word about your site on social networking sites. Some social networking sites also use the nofollow attribute in their links but like social bookmarking sites this can lead to traffic to your site and links on sites which do not use the nofollow attribute in their links. Someone may write a review or mention your site in one of their articles just because they found your site user friendly. The old word of mouth via offline conversations whether in casual conversation or at a networking event can result in any of the above online search engine optimization benefits. Think big! The more usable your website or blog is, the more word will spread around about it. So how do you improve the usability of your website or blog? Part of your site being memorable is that it is different but if you want to buck design conventions will your visitors understand how to use your site easily? Keep in mind that if you have optimized your site properly a visitor can enter your site on any page, usually the page that best fit their searched for phrase in their preferred search engine but not necessarily your home page. This is why consistancy between pages on the site is important. Typical elements should be on each page. Logo and tag line on each page. You might not have a tag line (you should though) but some kind of logo or typical head section of the page should be established and on each page. This identifies to the visitor who’s site they are visiting. The main navigation linking to the important pages within the site. The secondary navigation linking to categories or sections of the site. Across the top of the page. This can be used for your main navigation on larger sites or if you choose to use a dropdown menu the categories/sections could be included in the top navigation. Down the left or right for the secondary navigation although if you have a smaller site one of these could be used as your main navigation location. In the footer you can use this area to show links to things like policies, copyright notice, shipping information, return policies or your social networking profile links. The goal with your navigation system is to make it easy for the user to get to the section of the site they wish to get to easily and quickly. With larger sites particularly providing a search function adds usability to your site. In the head section (top) of the web page design preferrably on the right. At the top of your side column. Sometimes a user follows an incorrectly typed link to your site or within your site and sees a 404 error, meaning the page could not be found. You may have even removed the page or renamed it for some reason and forgot to use a 301 permanent redirect instruction in your .htaccess file. Providing a custom 404 error page helps the misguided user to a way to find what they arrived expecting to find. Keeping in mind that PCs and Macs have different sets of default fonts installed, pick a universal font (called font-family in your cascading stylesheet (CSS)) and use it consistantly through out the site and the same way. One obvious sign of a DIY (Do It Yourself) website is that the same font is not used throughout the site. This is a particular problem with content management systems and ecommerce software where the person editing the content uses the HTML editor as a word processor, forgetting there is a CSS file associated with the design or not understanding the styles will be applied once the page/changes are live on the site. Font sizing (called font-size in your CSS file) is another area where inconsistancies occur. These are set in the CSS file associated with your design. If you don’t like set size, fix the style in the CSS file, not via the HTML editor you are using. You can also create additional styles in the stylesheet for special instances of highlighted text. Site design graphics give the overall feel of your site. If you are adding additional graphics (say buy now buttons or social connection buttons/icons) they need to fit the feel of the original design. Nothing screams “this site is maintained by someone other than the original person who designed the site” more than graphics that have a different style/feel being used after the original design was done. You can either hire the original designer to create additional graphics to match the original theme or search for someone that does the same style of graphics so they don’t stick out as “add-on” graphics. Keeping with the original colour scheme is also important. If the design was created by a professional graphics person a colour scheme was planned. If you built the site yourself use one of the colour scheme sites to find coordinating colours. Bottom line is: Everything should match to look professional whether you did it yourself or purchased the theme. Have you ever noticed how nice a site looks when all their product images are all the same size? Doesn’t it make the site look nice and tidy? Making all your content images look tidy can be a little time consuming and stressful for the DIY webmaster but it is worth it. The user “learns” how far to move the mouse to activate the zoom feature of the next image in a category page for example. For consistant site content images you are going to decide on the “standard” size you want to use for the entire site then resize/edit the images to be included in a graphics program, not by using coding. When you manipulate image sizes via coding the browser still downloads the original image as it was uploaded to the web server and just changes the dimensions visually in the page. Downloading large images slows down the rendering of your pages. The browser stops as the image is downloaded making it difficult for users to visit other pages on the site when you have a lot of images. Alternative text (alt text) appears when the user decides to surf the net with images turned off to save on their internet usage costs. Alternative text is also read out to those who are blind or have poor vision and use assistive technology to read web pages to them. The search engines notice your image alt text also. To be useful, the alt text should describe what is contained in the image. Links are the way people get around the web and move around within your site. Making your links easy to find and use leads to better usability, accessibility and internal linking (search engine optimization). Convention says unclicked links (links the visitor hasn’t visited yet) should be underlined. You will notice on this blog our links are underlined and bolded so they stand out. By default, unstyled unvisited links will be blue and underlined. If yours are not then the defaults have to altered via the CSS file associated with your design. a:link is what you are looking for in the CSS file if you want to fix this. Visited links by default change to a purple colour. If yours don’t then the designer has changed the visited state of links using a:visited setting(s) in your stylesheet. Whether the default link colours go with your theme or not, make the linked text stand out. This would include not underlining text that is not a link. Very confusing for the visitor and annoying when clicking the text and it doesn’t take you anywhere. Make the linked text descriptive. Click here is the most useless, unusable, inaccessible and unsearch engine friendly thing people do on websites. Make the linked text descriptive. Link a phrase within a sentence so the reader understands why the text is linked through the surronding text. This not only makes the link user friendly, it adds accessiblity and search engine optimization to the link. Utilize the link title attribute. A link can have a title attribute within the coding of the link. Using the title attribute of your links adds usability, accessibility and search engine optimization to the link. When the user puts their mouse over the link a tip is displayed for those who can see the link, is read out to those who use assistive technology and is read by the search bots. All three know what to expect at the linked page. Ultimately you want to make it easy to navigate around your website or blog. People don’t read content from top to bottom on the web like they do when reading a book. When you read a magazine do you read every single article top to bottom? Not usually, you scan the article to see if you want to read the whole thing. Well, people on the web do the same thing. They scan the page looking for key information they are looking for. Add white space to breakup the content and define areas of the pages. Information all squished together is hard to read and comprehend. By including white space (empty spacing areas) to the content of your page it makes it easier to read and scan. Use headings and sub-headings to define areas of the page or sections of the content. Using headings and sub-headings help define the areas and sections of the page. It also creates some white space when the heading tags are formatted properly. There are 6 heading tags available (H1 through H6) within the HTML specification. Use them as intended and in the right heading hierarchy order. This adds accessibility and search engine optimization to the page as well as making the structure of the page clear to the visitor. It is really hard to read a page where the text on the page uses different alignment. Keep the text alignment of the page consistant, preferablly left aligned for easier reading. Centered and justified text is hard to read. A centered main heading would be ok but having a mash of centered headings and non centered headings makes it hard to figure out how the page is structured. Provding better usability on your website or blog will improve your return on investment (ROI). The more happy visitors you have the more social proof you will get via social bookmarking, social networking sites and general word of mouth endorsements. See your profits increase, newsletter signups grow, your readership grow or what ever goals you have set for the site be accomplished by reviewing and improving the usability of your site. The meta description tag is a member of the meta elements of your web page. We have already discussed the meta keywords tag and title tag (which isn’t really a meta tag but some lump this in when discussing meta tags). The meta description is hidden from your visitors when they view your page but is accessible by the bots (also known as web crawlers, search engine robots and search engine spiders) that roam the web. The contents of your description meta tag may be displayed in the search results of the search engines or in a site description in a directory or information site where they scan your description meta tag. Some CMS (content management systems) and ecommerce software software may also use this information when displaying a summary page like an articles list or category list. I like to keep all my meta tags that change per page together in the head section just before the opening body tag. This is so all the typical other stuff in the head of the coding can be inserted with an include or if building a DWT (dynamic web template) the editable section in the head section is all together and one set of editable region tags is required. Saves on a bit of coding. The contents of the meta description tag should describe what the page is about. Some search engines may use the contents of the meta description in their results when your page comes up for a search. There no way to force the search engines to display what you want as the description. All you can to is write the best description for the page and hope that the search engines think that is better than what they came up with. Google’s creation of sites’ titles and descriptions (or “snippets”) is completely automated and takes into account both the content of a page as well as references to it that appear on the web. We use a number of different sources for this information, including descriptive information in the META tag for each page. Where this information isn’t available, we may use publicly available information from DMOZ. While accurate meta descriptions can improve clickthrough, they won’t impact your ranking within search results. We frequently prefer to display meta descriptions of pages (when available) because it gives users a clear idea of the URL’s content. This directs them to good results faster and reduces the click-and-backtrack behavior that frustrates visitors and inflates web traffic metrics. While we’re unable to manually change titles or snippets for individual sites, we’re always working to make them as relevant as possible. You can help improve the quality of the snippets displayed for your pages by providing informative meta descriptions for each page. While search engines reserve the right to use a variety of inputs for filling out site description snippets in their SERPs, webmasters who provide unique, concise, compelling, and keyword-laden descriptions in their tag’s description attribute help guide the development of their websites’ SERP captions. For each and every page the meta description needs to be different. When you something like a ecommerce site with different similar products similar meta descriptions (just changing the product name for example) doesn’t cut it. The text you put in the meta description needs to describe what the visitor will find on the page when they click your link in the search results. The more enticing you make your meta description, the better your click through rate will be from the search results, if the search engines use your meta description. Also consider the “other” bots that read your meta description for inclusion into their directory or resource listing page. There is also the category listing or article listing your CMS or ecommerce site will display if they use the meta description tag from the page. Use a keyword phrase in your meta description. The keyword(s) will be bolded in the search results if the search engines use your meta description instead of their own. But don’t list a bunch of keywords. That just looks spammy and really is of no help to the person who did the search when they see you in the search results. How Long Can My Meta Description Be? This also shows how the different search engines will display the search result listing for SEOmoz when meta description length is the search phrase plus that the keywords are bolded in the results. The specifics on how to add a meta description to your pages will depend on how your pages are constructed. For a static (regular) web page you would open the web page file, add the meta description tag, save the file, close it then upload to your web server. With a content management system, blogging software and ecommerce site software you will have to consult the owner’s manual. They quite possibly have a field for you to fill in within your control panel. It is also possible a plugin will be needed to add this capability. Which ever method you use to add a meta description to your pages make sure it is unique for each page and descriptive of what the visitor will find on the page. Remeber that the search engines might decide that they know better as to what to put for the description in your search result based on the search conducted. Don’t get upset, especially if you are on the 1st page. All you can do is have a look at what you have written and maybe tweak it but there are still no guarantees. As part of your link building strategy you may have considered buying links on sites or exchanging links with other sites. After all links are what make the web work, right? That is how people find you when they did not find you through a search in their favourite search engine. Before you buy or exchange that link you should be aware of how it could affect your standings in the search results and what rotten things some people do to make the link on their site worthless to you (but gladly took your money or got that nice incoming link from you). Incoming links (a.k.a. backlinks) are good if they are from quality sites that are related to the subject of your website or blog. This whole thing can snowball if you notice someone linked to you that was a respected authority on your subject. It can turn into a business partnership, a friendship and/or further mentions by you and the other site about each other’s content. Win, win situation. Now put you newcomer to your site hat on. If they see irrelevant links to other sites from yours they are not going to be too impressed. One way to build quality content is to find related articles to the subject of your content and include them as references to backup what you have said or for further information. No one is going to want to link to a site that doesn’t take care when including outgoing links to other sites. This is organic link building. Why ruin it by including links to other sites just for the link exchange or a few dollars? First you have to be aware of what the search engine guidelines are regarding buying links and link exchanges. Bing’s position on link building is straightforward – we are less concerned about the link building techniques used than we are about the intentions behind the effort. That said, techniques used are often quite revealing of intent…. So now you know where you stand with the major search engines in regards to exchanging and buying links. Read the full articles quoted so you get all the information. If you decide to proceed with link exchanges or buying links there are some other thinks you should know before doing so. There are some unscrupulous people out there and if you are a novice to this you need a checklist of what to look for. Remember not all link exhanges or bought links are bad. You just have to check them out before committing. When you receive an offer of buying a link or exchanging a link, ask what page yours will be on and go look at it. Also checkout the site in general. Is this a site you want to be associated with? Can People and the Search Bots Actually Find the Page? When looking at an offer for link exchange or purchase go to the site as new visitor (the offer sometimes tells you which page your link is going to be on). If you were a visitor to the site could you easily stumble upon the page or otherwise find it without knowing where it was? Can the search engine bots find it? Reviewing some of the link requests our clients have received, there is no way an average visitor would find the page offered. Link builders search the net looking for links for their clients. That’s fine. Some people don’t have time to do this and decide to hire someone to do it for them. The thing is you have to read the link request email to determine if they actually looked at your site or just rifled your email address off your site. After you have received a few of these you will be able to determine the form letters from legitimate link requests. The nofollow attribute is used by the search engines as an indication they should not follow the link provided. You can view the source coding of the page where your link will be placed or use a nofollow plugin if you use Firefox to see these. Not all nofollow links are bad. If the audience of the page fits your target audience then they could still drive traffic to your site. Another way the search engines can be told not to follow the links on the page is with a meta tag in the head of the web page coding. Like the nofollow attribute in links, if you view the source code of the web page you can see it in the head section (between the<head> and </head> tags) of the web page coding. Will the link be on a page full of links or resources type page? Is the page topic specific? Say your site is sewing related. Is it going to be on a page with only sewing related links? Does the page allow for a description or some kind of blurb on it about your site with your link within the content of the description? Page Blocked From the Search Engine Bots? As a novice website owner you might not even know what a robots.txt file is. The robots.txt file is a plain text file on the web server that contains directions to the search engine bots about what sections of the site to stay out of. Some people put the link pages in the list. Not all search bots follow these directions but it is something to be aware of. The website owner might have actually attempted to do this but did it wrong. Viewing the source code of the page and looking for the robots meta tag in the head section is another way to block the page from the search engines. Look for <meta name="robots" content="noindex, nofollow"> This tells the search engine bot not to include this page in their index (in this particular example the nofollow is included also). Are you prepared to check that your link is actually placed where they said it would be? Some people use a delay tactic where you put their link on your site but they just never seem to put yours on theirs. In the meantime they have an incoming link to their site. How Long is the Link Going to Be For? Some link building offers are for a specific amount of time. Once that time has expired you loose the incoming link. If it was supposed to be permanent, are you going to check regularly that your link is still there? Only fair if you are providing a permanent link the person you bought or exchanged links with does too, right? Does the Link Go Directly to Your Site? When you put your mouse over a link, the url of the page you will be taken to will appear in the bottom right of your browser window if the website owner has not done some creative scripting to fox you. This is an old technique. Webmasters use to use a script to place a message instead of the url in the bottom status bar of the browser. What you have to do is actually click the link to see where it takes you. Some will boast that your link will be on a PR whatever site or page. If you were promised a specific PR page, make sure it is. PageRank isn’t really something that important to be worried about. It’s nice but in the background the PageRank of the site and pages within it are constantly changing. The tools to check PageRank are not that accurate either. For example, the Google Toolbar PR bar is out dated as soon as it is updated. Look at the future potential of the page where your link will be. Does it have good content that eventually will earn a better PageRank? Does the site look like a stable site that is in this for the long haul and they are going to work on getting a better PageRank some day? Cloaking is where the search engines see one thing and real visitors see another. You can check for cloaking by looking up the page in the search results. Does the description match what you see on the page? View the source code and check the meta tags also. Are They Offering to Put Your Link on a Different Page Than What You are Linking To? There are link schemes where you are offered an exchange where you link to a page but the link to your site will be on a different site all together. They are offering this to try and hide they are purposely link building (instead of organic link building). Do you want to get involved with this type of scheme? Can You Link to a Page on Your Site Other Than Your Home Page? Each page on your site needs incoming links. When link building you need to spread out the incoming links so people see the other pages on the site. If you worry about PageRank, it is quite possible for an inner page of your site to have a higher PageRank than your home page because of the quality and quantity of incoming linkds to it. Maybe you have a special page you want to building links for. Say, your specials page. The quickest way to get people to that page is to have a direct link pointing to it. There are link building specials all of over the place. Just do a search for link building to see them. If you are going to use one of these services make sure the links are going to be built over an extended amount of time. If you read this article from top to bottom you would have already seen that Bing states a signal of unnatural link building is a bunch on new incoming links all of a sudden. When Was the Page Last Cached by the Search Engines? Using the Google toolbar you can check the last time Google cached the web page your link will be on. If it has been a long time that means the site owner is not keeping the content of the site fresh which resulted in the search bots saving their energy and not visiting very often. Is Your Link Going to Stay on the Page? What this question is about is: Are they adding new links to top of the page as they add them and is your link going to get bumped off to the next page? This happens on classified and some directory sites. As previously stated, exchanging and buying links (for the purpose of advertising) is not a bad thing. You just have to be careful of the deal. Will this deal really benefit your site? Where is the title tag in my web page coding? How is the title tag used? How should I construct my title tags? My title in the search results is different than what I have in my title tag! We are going to answer all of these today. Click the links above to skip to the specific question you came looking for the answer to or read the whole article. The above are basic examples of where to find your head section and title tags. Depending on how your site is built and run this section could be in a separate file which is included when the page is assembled and presented to the visitor. e.g. The head section of a site built using WordPress is in the header.php file of your theme. An ecommerce site might have this section in the main template that is used for the general layout of your web pages. How is the Title Tags Used? The contents of your title tags are shown in the browser’s top bar. Look above. You will see the title of this article in the top bar of your browser (or in the tab if you are using tabbed browsing). When you or someone else bookmarks your web page the title tag contents are used as the link to your article. If a visitor still uses their browser’s own Favorites or Bookmarks, once they add your page to their Favorites the title of your page will be listed. The search engines may use your chosen title tag for the page when displaying your page in the search results. Read on to find out why I said may. Each page needs an unique set of title tags. This is something that some content management systems and ecommomerce software do not do. If the software running your site is not allowing you to have unique title tags for each page, complain or get one that does. WordPress, for example, by default uses the post/page title you fill in at the top of the editing screen. You want your whole title to show when someone bookmarks your page in their browser Favorites, visits your site, bookmarks your page on social bookmarking sites and when the search engines show your page in the search results, don’t you? Well there is a limit to the number of characters your title tag can be to accommodate all these different senarios. The W3C (World Wide Consortium) which develops the standards for the web recommends you keep your title tag contents to 64 characters so the title will be displayed in browser Favorites and the top browser bar. The general consensus for your title to display properly (without it be truncated) in Google is was 66-70 characters. (see update below) You can see in the image below our Most Common Screen Resolution artile title doesn’t quite fit with Google’s layout to accommodate their page preview over on the right. Google has truncated the title based on the search I did to get the screenshot (web page mistakes). Update March 2014: Google changed the layout of their results pages to include larger text for page titles. Now, you have even less room to get your message across. According to Dr. Pete from Moz 49-57 characters works. Read his whole article here: New Title Tag Guidelines & Preview Tool. There still isn’t a magic number to use. The search engines are including your site name in some of the results, even if you do not include it in your title tag. If I had searched for common screen resolutions the title fits. The reason for these 2 different results will be discussed later in this article. Ok, this is a user experience thing more than a SEO thing. Use capitals in your title tag just as you would use capitals in the title of a paper you wrote in school. It looks more natural for the reader. All caps is definately a no no. All caps is considered yelling on the net. Create a title tag that communicates what the page is about. Something that when the user bookmarks the page in their Favorites they will know by looking at the title what the page is about would be a good guideline. Will the user know what the page is about without reading the search description or social bookmarking description? Use some keywords the person searching for the information on your page would put in the search engine box. Notice I said some. 2 or 3 keyword phrases would be fine. A title tag full of a bunch of keywords just looks spammy and doesn’t really convey to the person looking through the search results what the page is about. Communicate what the page is about but also make the title tag attention getting. If you were searching for the information on the page would your chosen title tag make you want to click the link in the search results, on a social bookmarking site or if someone tweeted your link? Can you afford to use up your character limits with special characters? If something in the title is copyrighted, trademarked or registered then maybe you could add the appropriate symbol to the title tag contents but other symbols are really a waste of valuable character space. Have you ever searched for something and in the results you see Home, About or Contact used at the search result link? That isn’t really very helpful. Think back to the person who bookmarks pages in the browser still. If they have a bunch of Pricing titles bookmarked, how are they going to know which one is you? A boring title is also a missed opportunity to incorporate some kind of title which includes a keyword or two that you could have been found for. Why Are My Titles Not Used in the Search Results? This really is a mystery to those new to search engine optimization. They made sure the title tag on each page is different, thought they constructed the perfect title tag contents and it’s not showing up in the search results! The search engines decide what title to put in their search results for your page based on what the user searched for. If you read this article from top to bottom this was demonstrated above under how the title tag is used. The title of the same article is different based on what is searched for. Google specifically addresses this in their Changing a site title and description – Webmaster Tools Help article. There is a video on that page you can watch. Bing also addresses the title tag in their Anatomy of a Bing caption. Compose your title tag contents so they are catchy, describe what the page is about, do not contain too many keywords or phrases and fit within the search results alloted space. Don’t get too upset if you composed the perfect title tags and they are not being used as intended in the actual search results. The title tag contents help the search engines (along with other search engine optimization techniques) determine what the page is about. If you are showing in the first 10 results for your chosen keyword phrase, be happy instead of upset that the search engines have a mind of their own. With the advent of DYI (Do It Yourself) websites and blogs those that are not web designers or web developers do not know how to tweak their sites (or just can’t due to the set-up of the DYI software they are using) without using plugins. This is good for plugin developers but bad for your DYI website/blog. One really needs to look at how many plugins they are using to run their site, which are repeating tasks and whether you really need all those plugins to run an effective site. Take stock of what plugins your website or blog is using noting what they actually do for the site. Are there plugins you are using that repeat tasks/benefits? Are some plugins disabled and just taking up space on your web server? Are the plugins on your web server making your site subject to hacks because they are out dated? Are the plugins you are using providing benefits to your target audience? Are the plugins you are using causing load problems at your web hosting? Which of the plugins you are using repeat tasks? One common mistake people make is running a bunch of SEO (search engine optimization) plugins. You need to pick one! They are all fighting each other and adding to the download speed of your site (besides confusing the heck out of you which one is doing what). Ideally, you should not need any if the theme of your blog or website has been built and programmed properly from the get go. Once you have sorted out which plugins you absolutely need remove the disabled plugins. They are just taking up space on your web server. You need that space for more important stuff like great content (pictures, videos, etc. if that is what your target audience wants to see). Disabled plugins can also be a source for your website or blog to be hacked as you would not be monitoring their updates. Did you know that even if a WordPress plugin is disabled it can still affect your site’s load time? Yes, it’s true! Every time someone opens your site, the database is checked to see which plugins need to be loaded, including the disabled ones. Your WordPress installation queries the database to see which plugins are active and which ones load on the post/page that your visitor has clicked on. It may only take a nano-second, but it does affect load time for each and every plugin you have. Some times plugins can’t be avoided. It is really important to keep plugins up to date if you are going to use them. If it is a registered plugin with WordPress, in your dashboard you will get a notice of updated plugins (active and non active). You can also follow the RSS feed for the plugin site in your RSS feed reader to monitor other plugin updates. Does the Plugin Benefit Your Readers? The latest greatest technique or what you think is cool may not be of any benefit to your targetted readers. Maybe they don’t care every image in your shopping cart has a zoom feature. Maybe they would rather phone you or email you instead of usng online chat. Just like choosing the right social network site to participate on, it all boils down to what the people you are trying to attract to your site want to see. If what you are doing is working or you know for sure that a plugin adds to your visitor’s experience then go for it. But if you are posting stuff people are not interested in (e.g. videos and slideshows that take too long to download or watch) then it’s time to rethink your strategy. Not saying to avoid all latest techniques and features. Just saying be selective about what is going to work for your site. If your site or blog is loading slowly then one of the problems could be that your share of the web server at your web hosting is over loaded. Each request sent to the web server to make your site or blog run consumes memory and other web server power. When multiple plugins are installed each adds it’s own links in the head section of your pages to scripts on your web space and it’s own CSS file too sometimes. If you are using a specific feature just on one page, the plugins generally still add their required “stuff” to the head section of all your pages. This sends unecessary requests to the web server when that particular feature is not used on the page. Do you really want to bore your followers by posting the same automated updates from your site? Yes, some of your social networking locations could have different followers but also you could have a lot of the same followers on all your social networking sites. Social networking is about being social, not spamming each location with automated updates (that’s a whole other post). Plus, just you plugging your articles is not a valuable as enticing followers to follow you on each social network because information posted on each is different. A bunch of different followers bookmarking your site or blog articles is better social proof. How Do I Avoid Using Plugins? You can avoid having to use plugins by taking a serious look at the software and theme that will be used to run your site or blog. Does it include all the on-page SEO HTML benefits you need? Does it use search engine friendly construction? Can the programming be altered without using a plugin? These are all things to look at before selecting the platform and theme to use for your site. Google Analytics script for example can be added to the footer of your theme. This way you require one less plugin and it is added to each of your pages that use this footer. That’s the point right? To collect data about each page on your site or blog. Adsense can be added to the sidebar (or any template or include in the theme) without a plugin. If you have a spammer problem there are a few things that you can do instead of installing something like Akismet (which can spam can legit comments through false positive findings). In the .htaccess file you can deny access from certain IP addresses or ranges (this could ban legit visitors though) or if you are using WordPress you can blacklist certain words, IPs, emails and/or domain names. Blogging software, content management systems and ecommerce software already (generally) require more processing on the web server and by the user’s browser due to their programming compared to a static HTML site. What is more important to you? Keeping up with the Jones by using all those plugins just because every one else is doing it or creating a site people want to visit because it loads fast, is not cluttered, provides what they want to see and doesn’t stall because of some 3rd party plugin or feature being unavailable. What ROI (return on investment) do you want from the site/blog? There are different things you can do for the on-page SEO (search engine optimization) of your web pages and blog posts. Today we are going to cover how you can improve your on-page SEO through proper use of the back ground coding (HTML coding) used to create your pages. Optimization of the HTML coding is one of many on-page search engine optimization tasks you can look at when deciding on a content management system, an ecommerce software package and/or when selecting a theme/template for your site. It is also something you can add to your checklist when hiring a web designer. When examining the search engine friendliness of a design or software package that you have not built or worked with yourself yet (e.g. Contemplating hiring a web designer or purchasing a theme/template) you will need to view the source code of the web pages. We will look at the HTML coding of a well optimized page from the top down next. The DOCTYPE declaration should be the first line of the web page background coding. This line defines what standard the web page is coded to. The browser uses this information to understand how the web page is constructed and to interpret the coding correctly. You can see if the designer has followed the standard specified in the DOCTYPE declaration by testing the page with the W3C HTML Validator. Code validation helps troubleshoot cross-browser compatibility rendering issues. It doesn’t solve all cross-browser compatibility issues but it eliminates your coding as the cause. With cross-browser compatibility in mind, if visitors to your page(s) cannot see them because your site uses browser specific coding or just doesn’t render well in their chosen browser you are not going to get organic incoming links happening. They will just leave without seeing what great content you worked so hard to compose. Web page load time also influences visitor happiness. If your web page download speed is slow due to excessive coding and the time it takes the browser to interpret your coding the visitors are going to leave. You once again have missed out on an opportunity to earn organic incoming links. Also, web page speed is one of the many factors Google uses when evaluating your pages. There is also the issue of website maintenance which isn’t SEO related specifically but if it is a chore to update your site then it does become an issue because you are not updating your content (which the search bots love). Right after the opening <head> tag should be a line defining the character encoding for the site. This is an important line of coding as it tells the browser what character set your website uses. If it is not there or is further down in the head section of your page the browser has to guess which character set you are using. If it guesses wrong, it will rerender the page once it figures things out. An annoying thing which will send visitors away. The content between the <title> and </title> set of tags will show in the topmost bar of the visitor’s browser window. It is also used when they bookmark your page in their browser and on bookmarking sites. The search engines will use the contents of the title tag in your search results also, if it suits the user’s search. Each page needs a unique set of title tags. The contents of this tag need to describe the contents of the page while being catchy and using the keywords/phrase you are targeting for the page. You can have unique titles for each page. You can edit the title tag contents to whatever you want. Some systems you can’t. You don’t have to have the name of your site first in the title of the page. Some systems won’t let you change this. If they won’t then this is an issue because all your results in the search results will start the same way, possibly cutting off the important part of the title, what describes the contents of the page. Like title tags, unique meta descriptions for each page are important. These could be used in your search results or picked up by a bot collecting resources for another site, like a directory. Make your meta description a mini ad describing what the visitor will find on the page. Now you may have seen that the major search engines are not using the meta keywords tag in their evaluation of your pages but it doesn’t hurt to include this meta tag as things could change in the future plus your seach function on the site could use them when producing internal search results for your visitors. One of the reasons the major search engines quit using the meta keywords tag in their evaluation was the people were misusing this tag to manipulate the search results. When used, it should contain keywords/phrases used on the actual page and not be stuffed with unrelated keywords or a zillion of them. Heck, you have to do keyword research anyways for the content of the page, so why not include the keyword meta tag to help keep yourself focused on the theme of the page if nothing else. One thing with the advent of web design is the use of plugins and scripts to make web pages fancier. This is all well and good if it provides a great experience for your visitors. Each line that links to something in the head section of your web page is called a request. The line requests (fetches) the function/feature associated with it. Each request adds to the download time of the page. The link and script tags in the head of your page adds to the overhead of the page. i.e. makes the web page coding larger and more complicated for the browsers to interpret. If the link line is fetching something from another site and the site is down this will stall the rendering of your web page on the initial fetch as the browser waits for a response from the other web server. It can also slow down the rendering of the web page if the other web server is busy or just slow. If a script is used on multiple pages, it is better that it is in an external script file (preferrably on your server). Once downloaded by the browser it is kept in the browser’s memory until you leave the site or the browser is closed. One thing with blogs is there are a zillion plugins to manipulate the contents of your blog posts. Each plugin you add increases the head section coding and requests of the page(s). Some of these plugins are not necessary as a good web designer/theme designer can incorporate these functios into the design without using plugins. Style tags are also in the head section of your web pages. These are called internal styles meaning that they are applicable to the page they are on. If the design you are looking at repeats the same styles on each page this adds to web page overhead, the browser has to reread the coding and increases the maintenance of the site. Using an external stylesheet (separate file linked to the pages with the link tag) is better all around. Reduces web page overhead, the browser keeps it in memory and it is much easier to maintain the site. Going back to blogs, each time you add a plugin it could a) insert internal style tags or b) add a link to it’s specific external stylesheet. Something to consider when you have more important stuff to be on the page like content. Each page needs a heading (just like you expect a chapter in a book to have). For proper heading structure the first heading tag on a page should be the set of <h1> and </h1> tags. These should not be around your logo or any other image at the top of your page. This set of tags belongs around the title of the page which is within the web page. Don’t confuse this title with the title in the title set of tags, they are differnt. There is a set heading hierarchy within the set of heading tags (h1 being the largest and at the top of the hierarchy and h6 being the smallest and at the bottom). Use these tags as they were meant to be used for, to create the headings within your web page to define sections of the page, and not for manipulation of the web page content’s appearance. If you don’t like the look of the h2 tag within your theme but want your headings to look like the style for the h3’s then this is fixable it in the stylesheet. Using the heading tags out of logical order interfers with the usability, accessibility and search engine optimization of your page. All the formatting of your web page content (making it look nice) should be in your stylesheet, preferrably the external one. Some content management systems and ecommerce software provide a builtin HTML editor. This is great for those of you who don’t care to learn HTML coding but the problem is that when you use something like the button which changes to colour or size of a section of content it adds what is called inline styling. This inline styling adds to the web page file size plus adds to the maintenance of the site in general if the particular styling you are applying is repeated throughout the site. Get you designer to add a style to the external stylesheet which you can reference within the content when you want it applied. Tables take time for the browsers to render. The browser stops to assess all the table coding before sending it to the screen. Poorly constructed tables or nested tables (tables within tables to force formatting) slow the web page download speed. The browser (and search bots) read the background coding of the page in the order it is in the page. Generally the designs that use tables for layout are not constructed so the search bots get to the content fast. e.g. If your design has a left navigation, usually the theme designer has not fixed it so the bots get to the center (or right) cell which contains the actual content of the page. The search bots have to read all the links in your navigation before getting to the meat of your page. While internal linking is a good thing, you don’t want to waste the search bot’s allotted time on your site reading links each time it comes to the site. CSS layouts are a bit difficult for some people to get their head wrapped around but these make it so much easier to maintain a site. All the layout and formatting is manipulated through one file, the external stylesheet. With CSS layouts (if the designer is good) you can construct the background coding in anyway you want between the opening <body> and closing </body> tags thus manipulating in what order the search bots see your web page content. After reading this article (which turned out long, sorry) you now have an idea of what to look for when constructing your own web pages or purchasing the services of others when it comes to on-page search engine optimization. HTML coding when used properly can be an easy way to improve the on-page search engine optimization of any site. How often have you looked at the HTML coding as part of your on-page search engine optimization? There seems to be a big confusion between Sitemaps and a HTML site map for those new to websites. We are going to run through what each is and what they are used for today to try and undo the confusion. First of all, notice the spelling of each. Sitemaps vs site map. Sitemaps are XML files. They are meant for search bots and computer programs that understand the Sitemaps protocol (standard). Not all bots that roam the net understand the Sitemaps protocol. The 3 big players in the search industry do, Google, Bing and Yahoo! along with some others. A site map on the other hand is a regular web page that humans, assistive technology and all search bots can read. It uses regular (X)HTML coding to present the information. We will cover Sitemaps first and then move onto (X)HTML site maps. In its simplest form, a Sitemap is an XML file that lists URLs for a site along with additional metadata about each URL (when it was last updated, how often it usually changes, and how important it is, relative to other URLs in the site) so that search engines can more intelligently crawl the site. Notice where the text has been bolded? Web crawlers usually discover pages from links within the site and from other sites. That means your pages are found by the web crawlers (also known as search bots and spiders) through your internal linking and by finding links to your pages on other sites. The first part is simple, build your internal linking structure so all search bots can find pages on the site other than the page they entered on. There is no guarantee a search bot or a human is going to arrive on the home page of your site. They can arrive on any page of the site through a search or from an incoming link somewhere. The second part, incoming links, you can help along by having great content that ranks in the search results and then the word spreads that your site has fantastic content through organic links. There are other ways to get incoming links but that is for another post. Using the Sitemap protocol does not guarantee that web pages are included in search engines.. When a person with a new site asks how to get their site indexed an bunch of people will say to create a Sitemap and submit it to Google, Bing and Yahoo!. That is a misconception. The bolded text above clearly states that submtting a Sitemap does not guarantee the site or it’s pages will be included by the search engines which support the Sitemaps protocol (not all do). Creating and submitting a Sitemap helps make sure that Google knows about all the pages on your site, including URLs that may not be discoverable by Google’s normal crawling process…. …Google doesn’t guarantee that we’ll crawl or index all of your URLs. When Should I Use Sitemaps? A small site doesn’t really need to use Sitemaps unless you are selling something and want to get your merchandise listed in a merchant/product search site that supports it as the file to feed your product information to their site. Your site has pages that aren’t easily discovered by Googlebot during the crawl process—for example, pages featuring rich AJAX or images. Ya, I know, Google listed if you have a new site it might help but remember, using Sitemaps does not guarantee your pages will be indexed. So lets look at site maps and how they work. What is an (X)HTML Site Map? An (X)HTML site map is a regular web page that can be read by any bot roaming the net, by those using assitive technology to surf the net and by regular web surfers. The (X)HTML site map contains links to pages on your site. If you have a large site, you would list the main pages (e.g. category pages) of the site which takes you to a sub site map with links to pages within that category. For a small site, just one site map will be fine. For search engine optimization and usability purposes, include a short description of what the person will see when they click the link. This will also help prevent your site map looking like a link farm page (page of just links). Again for search engine optimization and usability purposes, a link to your site map should be included on each and every page. Remember, a bot or human can arrive on any page of your site so you want to make it easy for them to find their way around the site to discover other pages. Also remember, web crawlers find page through links so a site map is like a directory to the site with links for the web crawlers to follow. When Should I Use a Site Map? On every site! As already explained, a site map is accessible to everyone, human and bots. There are all kinds of bots roaming the net. Ones for directories, ones looking for reference sites to add to their site, all kinds! 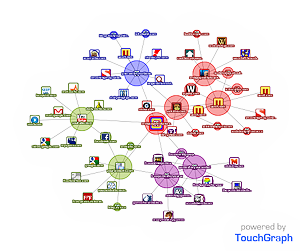 You can earn some free organic links just by providing a site map. Ok not every site needs a site map to start with. If you are starting out small with 2, 3 or 4 pages a site map might be overkill at the beginning but plan for where the link will go in the future. As your site expands you can distroy the usability of your design by adding too many links to the navigation. Also too many links on a page compared to actual content can turn your pages into what looks like a link farm/spammy page. For people who have accessibility challenges and those who just plain got lost on your site, a site map is a savour. They can just go to the site map to find where they want to go next on your site. Which Should I do First? A Sitemap or a Site Map? The site map! It’s the easiest to do and provides the most initial benefits: accessiblity, search engine optimization and usability. But everyone says to do a Sitemap! When deciding which is better for your site, using Sitemaps or a site map, think beyond the search bots. You should always build your site for people first so that would include creating a site map first. Later on, if your site gets really big or you decide to add your merchandise to a shopping search site, then tackle creating Sitemaps. All it takes to attract the search bots is an incoming link from somewhere that gets visited by the search bots regularly which links to your site. The bot will find your site map and explore the rest of your site way quicker than you sitting around fretting and waiting for Google to review and index your Sitemap. Entering into the online social environment isn’t any different than networking offline. Just like offline, if your purpose of online networking is to create connections to eventually expand your business connections then you have to be where your target market is. Social networking can take a lot of time if you want to be successful at it so you need to be selective about where you are going to be or it will gobble up your whole day resulting in no actual money making work being done. 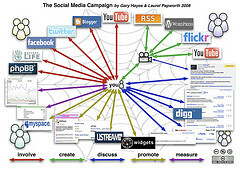 Keeping in mind what the name social networking (i.e. you are supposed to be social, not just selling) means, coming up with a productive social networking strategy is important. Yes these are popular social networking sites but so are YouTube and Digg in some circles. It all depends on where your target audience is on the net. You might have better success using a niche social networking site than one of the more popular and busy busier social networks. 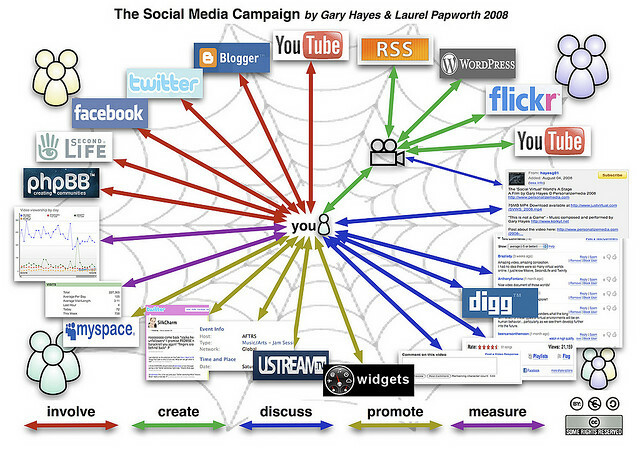 What social networks, social bookmarking and social media sites are your target audience using? Where on the internet are they? Maybe social networking isn’t where you need to be. Do they like forums or traditional email groups better? Do they even know and understand social networking? Where are your competitors on the internet? Are there too many of them in one location? Can you find an untapped place where your target audience is but lacking your competitors? There are lots of things to learn about when venturing into online social networking so spend some time researching what types of social networking, social bookmarking and social media are available. You need to understand how each works to use them to their full potential. You won’t learn what works and what doesn’t work for your target market if you don’t experiment with the different ideas you see on the net. You will not know if your online social networking is working unless you set some goals. Perhaps it is to meet 3 new people a day or find the right crowd to socialize with within a month. Maybe you have a longer term goal of increasing your website or blog visits by 25% within 6 months. What ever the ultimate purpose of using social networking is (not forgetting the social part) you need some milestones to shoot for just like any other marketing or business plan. With this information in hand, you can come up with a better plan of attack. Your plan can be adjusted if you find it is not working but don’t give up too soon. It takes time to build up relationships (as in offline networking) so don’t expect super results right off the bat. There are thousands of social networking sites available to join. Select a few so your time is spread effectively on each of those you chose to use. Networking takes time and devotion. Signing up for a social network and then not putting in the time to build relationships isn’t going to work. Prune your message and your list and build a reputation that’s worth owning and an audience that cares. You will see offers of selling bookmarking services, Facebook fans and/or Twitter followers. Even offers to set you up on hundreds of social networking sites or forums. These are not real connections. How can you communicate with and build a relationship with these people who may or may not be in your target audience? Real connections come when you personally participate in the community and exchange with the members of that community. It might take you a while to build your network of connections but they will be people who truly are interested in what you have to say, your knowledge and what you can offer (as in being an expert in your field). Thousands of connections does not equate to immediate growth of your business. Whether you decide to brand yourself or your company, having an consistent logo, avatar or picture across each of the networks you belong to will make you a familiar face if people see you in their own collection of social networking memberships. Learn how you can personalize each of your profiles at the sites you join. Some may have limited options but others will let you really brand your profile. Social networking isn’t just signing up for every popular networking site. It requires time devoted in the right social networks for you, your busines and your goals. Maybe joining a social network that is not related to your business/work is the ticket to making a whole new bunch of friends that can later turn into business connections. Social Media Marketing 2015: Where Is Your Audience? I Don’t Have Time For This Social Media Thing! We participated in the V7N’s last blogging challenge in January and we are participating in the new one starting on March 7, 2011. There are prizes! V7N is giving away listings in their web directory to 3 randomly selected participants. There is also prizes for referring at least 5 people to join in the fun. To enter, join the V7N forums and post your entry in the V7N Blog Challenge Participants thread. One of the easiest ways to get backlinks to your website or blog is to build organic incoming links to the site. Each organic link is a vote for your site without you doing any work other than providing great content and keeping it up to date. What is an Organic Link? An organic link is a link from someone else’s website, blog or social account where they linked to your site without being asked to. You had nothing to do with this other than provide great content that they felt was worth sharing with their readers and/or followers. As people find your articles or website pages they will link to a specific page within your website or blog. These links can be within the content of the article or listed as a reference at the end of the article. They are a great way to drive targeted visitors to your site because the person that linked to you has vouched for your article or page. They drive targeted traffic to your site. The search engine bots follow the links they find on other sites and consider a link from a related site a good vote for you site. Great way to get known in your field/niche. The more organic links you get from trusted sites related to your niche the better. Over time you will be in the ranks of trusted sites too. You are probably thinking the “provide great content” answer is just a suggest coming from a broken record. Well it is not. The way Web Page Mistakes (and other sites we own) has built backlinks is by providing quality content that our targeted audience likes to read. Our articles are linked to from educational sites like University of Minnesota Duluth’s Web Design References based on the content we provide. This can work for you also in your chosen niche. Become the “Go To” resource in your niche and you too will start get links from respected sites without asking. Participating in communities related to your niche or where your target audience are to be found is a great way to establish yourself as an expert in your field. This doesn’t mean you go in there and start self promoting and link dropping though. Be a part of the community first. Provide solutions to posted problems. Start interesting conversations. Post related resources you thought the community would be interested in. Provide a link to me page complete with the coding people are to put into their pages when linking to your site. Now that we have social media, provide social networking icons to make it easy for people to quickly post a link to your article on their favourite social networking or social bookmarking site. Demonstrate your expertise by providing How To or tutorial articles for your product (if you sell one), your service (again if you sell one) or a general instructional article than your niche would be interested in. Why to you think when you search for something like Photoshop tutorials there are so many? Because it works. Some new tax come in that affects your industry? Write about it. Cover the controversial side if no one else has. Or do the opposite, find the good points about the issue if everyone is writing about the negatives. Do some research on little known facts about your industry. Provide your research results on your site. This is how some people have established themselves as experts in their industry. Dan Zarrella is one person that comes to mind. He started analyzing social media and social media strategies and has now earned the respect of many as a social media researcher. List posts on blogs or list articles are always popular. Lists of related resources or tools that you have tried complete with your review work too. Don’t be afraid to link out to these. It is how you become the “Go To” resource in your field. Plus it will get you noticed by the resource and could snowball into an organic link back. If you have not created a blog yet, you should. Sharing information on your blog is another way to build your expertice in your field. Include a RSS feed with your blog. This way your readers can subscribe to your blog and be notified of your new content. Also, some social networking sites let you connect with your blog and post updates to your profile. Develop a useful product or service for your niche in the industry. Something new and exciting. Create videos and make the available on your site or blog. People love videos right now and good ones spread like wildfire via the social networking sites and via email. There are all kinds of ways to work on your organic link building. You just have to provide great stuff and present it uniquely. GoogleWebMasterHelp has a video done by Matt Cutts: What are some effective techniques for building links? you should watch to learn more effective ways to build organic links. Matt also talks about organic links in this video: Is there such a thing as building too many links? This article was created as part of the V7N 30 Day Blogging Challenge. Click the image below to see who else is participating.